This year a total of $7,000 in scholarship funds was awarded. The winners were selected from applicants based on individual commitment to the community, future plans and personal interviews. 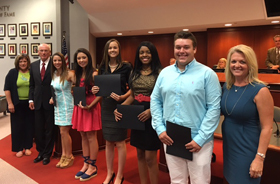 Congratulations to these outstanding young people who share Scott's vision and passion for education and community. This year a total of $10,000 in scholarship funds was awarded. The winners were selected from applicants based on individual commitment to the community, future plans and personal interviews. The Scott Strong Memorial Scholarship Fund Committee selected 12 Lake County graduates as recipients of the Scholarship. This year a total of $10,000 in scholarship funds was awarded. The winners were selected from over 75 applicants based on individual commitment to the community, future plans and personal interviews. The Scott Strong Memorial Scholarship Fund Committee selected 16 Lake County graduates as recipients of the Scholarship. The funds set aside this year were matched by the Alliance Healthcare Foundation and a total of $9,250 was awarded. The winners were selected from 51 applicants based on individual commitment to the community, future plans and personal interviews. The Scott Strong Memorial Scholarship Fund Committee selected 13 Lake County graduates as recipients of the Scholarship. This year a total of $10,500 in scholarship funds was awarded. The winners were selected from 80 applicants based on individual commitment to the community, future plans and personal interviews. The Scott Strong Memorial Scholarship Fund Committee selected 12 Lake County 2011 graduates as recipients of the Scholarship. This year a total of $10,500 in scholarship funds was awarded. The winners were selected from 78 applicants based on individual commitment to the community, future plans and personal interviews. The Scott Strong Memorial Scholarship Fund Committee has selected 9 Lake County 2010 graduates as recipients of the Scholarship.